iRobot, the Apple of the robot vacuum cleaner world, has made a breakthrough in robotic cleaning with its latest model, the Roomba 980. It's the first robotic vaccum cleaner that can map and independently clean up to a 2,000 square-foot space. 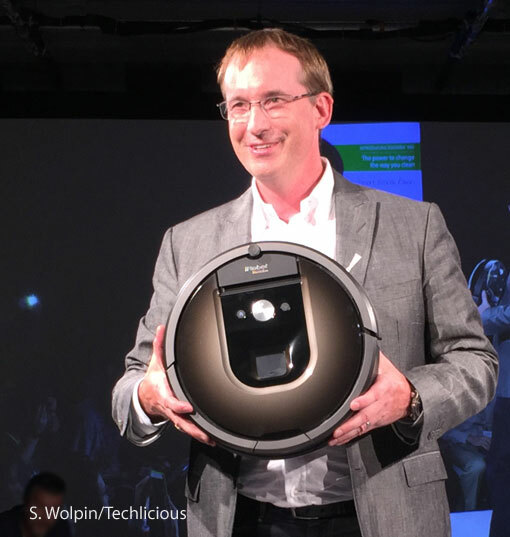 Colin Angle, co-founder and CEO of iRobot, called the 980 the most important Roomba since the company's inaugural model in 2002. By mapping your home, the 980 knows where it's been and so won't clean the same spot twice – unless it needs to – and knows where it needs to go. If the 980 realizes after a couple of hours that it's low on power, it automatically returns to its docking point. After a 19-minute recharge, it will then start out again and finish the job. 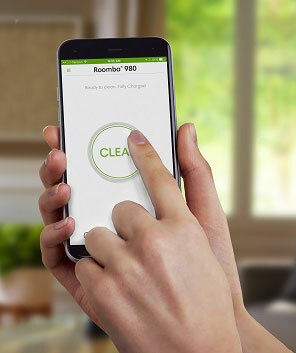 The 980 also can be controlled remotely and simply via the new iRobot Home iOS or Android app from anywhere you can get an Internet connection – boot the app and you get a giant circular CLEAN button. Simply tap and the 980 begins its cleaning. The app lets you easily schedule automatic vacuuming, one or two pass cleaning, edge cleaning and Carpet Boost for a deeper clean. The app stores a history of your cleaning sessions and dirt detect "events." You also can name your 980 and even give it a birthday. However, the 980 is not compatible with any smart home systems or platforms such as Wink, Iris or Apple's HomeKit. According to iRobot executives, no single system has yet asserted itself for the company to associate itself with. Angle noted the 980 "will change the role robots play in our lives" and cited the role of maps have played in history, noting that noted explorers Lewis & Clark took a year and a half to get from St. Louis to the Pacific sans maps, but only six month to return with their new maps. "It's all about understanding your environment." 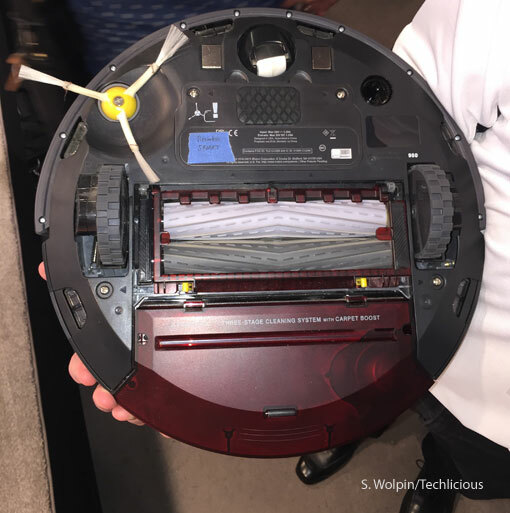 At just 3.6 inches tall, Roomba is designed to fit under most furniture and kickboards, and can officially surmount carpet lips and doorjambs up to 5/8ths of a inch high, unofficially up to an inch high. The 980 is equipped with a camera that fuels iRobot's Proprietary Visual Simultaneous Localization And Mapping (vSLAM) technology, adapted from the company's $50,000 AVA 500 industrial robots. The company's sophisticated iAdapt 2.0 Navigation software uses a suite of sensors to discover, map, navigate around furniture and clutter, and adapt to changes in its assigned cleaning environment. Dirt Detect, a feature found on the company's 700 and 800-series units, allows the 980 to "see" dirt and focus on it, making sure an extra dirty spot gets cleaned. Sensor redundancy lets the 980 navigate in the dark or even with a cat riding on top. To avoid long hair entwining and crippling the vacuum, the 980 doesn't use traditional roll brushes, but soft treaded rubber rolls instead. These soft rollers easily pop out to remove any hair that does get wound up. The 980 also avoids getting tangled up on rug tassels. To maximize power, the 980 has two AeroForce sucking speeds; a standard setting for solid floors and Carpet Boost, which automatically doubles up sucking power when the 980 detects it's on a carpet or rug. The 980 can be bought on iRobot.com or Amazon for $899.99.. It looks nice and powerful. Waiting to hold the best version!